Simvastatin and clopidogrel are commonly used together in the treatment of cardiovascular diseases. Organic anion transporting polypeptide (OATP) 1B1 activity markedly affects the hepatic uptake of simvastatin acid, whereas both simvastatin and simvastatin acid are sensitive to changes in cytochrome P450 3A4 activity. Clopidogrel and its metabolites inhibit OATP1B1 and CYP3A4 in vitro. We studied the effect of clopidogrel on the pharmacokinetics of simvastatin in a randomized crossover study. Twelve healthy volunteers ingested either a dose of placebo (control) or 300 mg of clopidogrel on day 1 and 75 mg on days 2 and 3. Simvastatin 40 mg was administered 1 hour after placebo and after clopidogrel on days 1 and 3. Plasma drug concentrations were measured for up to 12 hours. Clopidogrel 300 mg (day 1) increased the concentrations of simvastatin and simvastatin acid during the absorption phase. After clopidogrel 300 mg, the area under the concentration time curve (AUC) of simvastatin from 0 to 2 hours was 156% (P = 0.02) and its AUC0–12 hours was 132% (P = 0.08) of that during placebo, whereas the AUC0–2 hours and the AUC0–12 hours of simvastatin acid were 148% (P = 0.04) and 112% (P = 0.52) of control. Clopidogrel 75 mg (day 3) had no significant effect on the pharmacokinetic variables of simvastatin or simvastatin acid compared with placebo. The effect of clopidogrel seemed independent of the SLCO1B1 c.521T>C genotype. In conclusion, as clopidogrel did not have significant effects on the total exposure to simvastatin or simvastatin acid, clopidogrel does not seem to inhibit OATP1B1 or CYP3A4 to a clinically relevant extent. Recently, an epidemiologic study identified an association between clopidogrel use and rhabdomyolysis caused by cerivastatin (Floyd et al., 2012), which is a substrate for cytochrome P450 2C8, CYP3A4, and organic anion transporting polypeptide (OATP) 1B1 (Mück 1998; Kantola et al., 1999; Wang et al., 2002; Shitara et al., 2004). The antiplatelet drug clopidogrel and its metabolites inhibit CYP2C8, CYP3A4, and OATP1B1 in vitro (Floyd et al., 2012; Tamraz et al., 2013; Tornio et al., 2014). Additionally, clopidogrel was reported to increase the plasma concentration of rosuvastatin in humans, suggesting that clopidogrel could be an inhibitor of OATP1B1 also in vivo (Pinheiro et al., 2012; Remsberg et al., 2013). Furthermore, clopidogrel was shown to markedly increase the exposure to repaglinide, which is a substrate for CYP2C8, CYP3A4, and OATP1B1 (Kajosaari et al., 2005; Tornio et al., 2014). The clopidogrel-repaglinide interaction was found to be mainly mediated by time-dependent inhibition of CYP2C8 by the phase II metabolite clopidogrel acyl-β-d-glucuronide; its KI and kinact for CYP2C8 were 9.9 µM and 0.047 1/min, respectively (Tornio et al., 2014). Based on published Ki values (Tamraz et al., 2013), inhibition of OATP1B1 was considered to contribute to the observed interaction to a significant extent (Tornio et al., 2014). For example, the IC50 values of clopidogrel and its acyl-β-d-glucuronide for OATP1B1 were about 4 and 11 µM (Tamraz et al., 2013), whereas their direct IC50 values for CYP2C8 and CYP3A4 were roughly an order of magnitude greater (Tornio et al., 2014). Simvastatin, a 3-hydroxy-3-methylglutaryl-coenzyme A reductase inhibitor, is commonly used in the treatment of hypercholesterolemia. Simvastatin is an inactive lactone prodrug, which undergoes reversible nonenzymatic and carboxylesterase-mediated activation in the plasma, liver, and intestinal mucosa to active simvastatin acid (Vickers et al., 1990a,b; Mauro 1993). The formation of other metabolites of simvastatin and the further metabolism of active simvastatin acid are mediated mainly by CYP3A enzymes, with a minor contribution by CYP2C8 to the metabolism of simvastatin acid (Prueksaritanont et al., 1997, 2003). Consequently, simvastatin is susceptible to interactions with CYP3A4 inhibitors and inducers, for example, itraconazole and rifampin, respectively (Neuvonen et al., 1998; Kyrklund et al., 2000). Simvastatin acid is also a substrate of OATP1B1 (encoded by the SLCO1B1 gene), one of the important hepatic influx transporters (Pasanen et al., 2006a; Niemi et al., 2011). Simvastatin acid, unlike the parent simvastatin, is very sensitive to changes in OATP1B1 activity, caused either by genetic factors or drug interactions. A common SLCO1B1 c.521T>C (p.Val174Ala, rs4149056) single nucleotide variation (SNV) is associated with a significantly increased exposure to simvastatin acid. In healthy volunteers, subjects with the c.521CC genotype had a more than 3-fold higher area under the plasma concentration time curve (AUC) than those with the c.521TT (reference) genotype (Pasanen et al., 2006a). Moreover, the OATP1B1 inhibitors gemfibrozil and cyclosporine increase the AUC of simvastatin acid severalfold (Backman et al., 2000; Ichimaru et al., 2001; Neuvonen et al., 2006). As concomitant use of clopidogrel and simvastatin is common and as it was predicted that clopidogrel could be a clinically important OATP1B1 inhibitor, we found it important to investigate the effect of clopidogrel on simvastatin pharmacokinetics in humans. Twelve healthy nonsmoking volunteers (four women, eight men; age range, 19–27 years; body mass index range, 19–26 kg/m2) participated in the study after giving written informed consent. Their health was confirmed by medical history, clinical examination, and routine laboratory tests before entering the study. All participants had normal blood platelet counts and hemoglobin values. None of the subjects used oral contraceptives or other continuous medications. The study protocol was approved by the Coordinating Ethics Committee of the Helsinki and Uusimaa Hospital District and the Finnish Medicines Agency Fimea. In a randomized, placebo-controlled, crossover study, the subjects ingested pretreatment with either a single dose of placebo (placebo tablets; University Pharmacy, Helsinki, Finland) or clopidogrel (Plavix; Sanofi-Aventis, Paris, France) for 3 days (300 mg on day 1 followed by 75 mg daily) with 150 ml of water at 8 a.m. The first group (n = 6) received placebo first, and the second group (n = 6) received clopidogrel first. The washout period between the placebo and clopidogrel phases was 1 week in both groups. On the placebo phase and days 1 and 3 of clopidogrel treatment, 40 mg of simvastatin (Zocor 40-mg tablet; MSD, Hoddeson, United Kingdom) was administered at 9 a.m. An interval of 1 hour between the ingestion of clopidogrel and simvastatin tablets was chosen to allow disintegration and dissolution of clopidogrel tablets before administration of simvastatin. On the study days, the volunteers had fasted overnight, a standard warm meal was served 3 hours after the administration of simvastatin, and snacks were served 7 and 10 hours after the administration of simvastatin. The use of grapefruit products was not allowed for 1 week before and during the study and that of other drugs was not allowed from 1 week before to 1 week after the study. Use of alcohol was prohibited the day before and on the days of simvastatin administration. On the days of simvastatin administration, timed blood samples were drawn from a cannulated forearm vein before administration of pretreatment, 5 minutes before, and 0.5, 1, 1.5, 2, 2.5, 3, 4, 5, 7, 9 and 12 hours after the administration of simvastatin into tubes that contained EDTA, which were placed on ice immediately after sampling. Plasma was separated within 30 minutes and stored at −70°C until analysis. For the determination of clopidogrel and its metabolites, the active cis-5-thiol metabolite of clopidogrel was stabilized by derivatization with 2-bromo-3′-methoxyacetophenone within 30 seconds of blood sample collection in whole blood EDTA samples, as described previously (Delavenne et al., 2010). The sample preparation and measurements of plasma simvastatin and simvastatin acid were carried out on an API 3000 liquid chromatography–mass spectrometry system (AB Sciex, Toronto, ON, Canada) as previously described (Zhao et al., 2000), with the following modifications. Chromatography was performed on a Symmetry C8 column (2.1 × 150 mm internal diameter, 3 µm; Waters, Milford, MA) using 10 mM of ammonium acetate (pH 5.0) (A) and acetonitrile (B) as the mobile phase. The gradient elution program was set as follows: a linear increase from 40 to 60% B over 4 minutes, followed by a linear increase from 90% B to 95% B over 1 minute, and then held for 4 minutes at 95% B and finally re-equilibrated at 40% B before the next injection. Quantification was performed using multiple reaction monitoring of positive precursor-product ion transitions at a m/z of 436 to 285 for simvastatin and m/z 437 to 303 for simvastatin acid. Deuterium-labeled internal standards were used for both analytes. The lower limits of quantification for simvastatin and simvastatin acid were 0.04 and 0.05 ng/ml, respectively. The day-to-day precision CV values for both compounds were below 15% and accuracy was within ±15%, except for the lower limits of quantification, for which both precision and accuracy were within ±20%. The sample preparation was carried out, and plasma concentrations of clopidogrel, the clopidogrel active cis-5-thiol metabolite, clopidogrel carboxylic acid, and clopidogrel acyl-β-D-glucuronide were measured with a Nexera X2 series liquid chromatograph (Shimadzu, Kyoto, Japan) coupled to a 5500 Qtrap tandem mass spectrometer (AB Sciex) according to a previously described method, with slight modifications (Holmberg et al., 2014; Tornio et al., 2014). In short, plasma proteins were precipitated by acetonitrile, and samples were centrifuged and loaded into the autosampler. The mobile phase consisted of 2 mM of ammonium acetate (pH 5.2) adjusted with 98% formic acid (A) and acetonitrile (B), and the chromatography was performed on a reversed-phase Sun Fire C18 analytical column (150 × 2.1 mm internal diameter, 3 µm; Waters). For the analysis of clopidogrel and the clopidogrel active metabolite, the mobile phase composition was initiated at 45% B for 1 minute and then increased linearly to 55% B over 5 minutes and held at 90% B for 2 minutes, followed by equilibration at 45% B. An isocratic solvent composition (42% B) was applied for the separation of clopidogrel carboxylic acid and clopidogrel-acyl-β-D-glucuronide. The mass spectrometer was operated in the positive turbo ion spray mode, with multiple reaction monitoring using target ion transitions of m/z 322 to 155, 504 to 354, 308 to 198, and 488 to 308 for clopidogrel, the 4b′cis-methoxyacetophenone derivate of the clopidogrel active metabolite, clopidogrel carboxylic acid, and clopidogrel-acyl-β-d-glucuronide, respectively. Deuterium-labeled forms of clopidogrel, clopidogrel carboxylic acid, and the 4b′cis-clopidogrel-methoxyacetophenone derivate served as internal standards. Deuterated clopidogrel carboxylic acid was used as the internal standard for both clopidogrel carboxylic acid and clopidogrel-acyl-glucuronide. The limits of quantification of plasma clopidogrel and the active cis-5-thiol metabolite was 0.05 ng/ml, and those of clopidogrel carboxylic acid and clopidogrel acyl-β-D-glucuronide were 100 ng/ml. The day-to-day CV was below 10% at relevant concentrations for all analytes. Simvastatin and its metabolites did not interfere with the quantification of clopidogrel and its metabolites and vice versa. The pharmacokinetics of simvastatin, simvastatin acid, clopidogrel, and its metabolites were characterized by Cmax, time to Cmax (tmax), AUC0–2 hours, AUC0–12 hours, AUC0–∞ (AUC0–4 hours and AUC0–∞ for clopidogrel and its metabolites), and half-life (t1/2), which were calculated by noncompartmental analysis using MK-Model, version 5.0 (Biosoft, Cambridge, UK). The elimination rate constant (ke) was determined by linear regression analysis of the log-linear part of the plasma concentration time curve. The t1/2 value was calculated by the equation t1/2 = ln 2/ke. The AUC values were calculated by using a combination of the linear and log-linear trapezoidal rules, with extrapolation to infinity, when appropriate, by dividing the last measured concentration by ke. 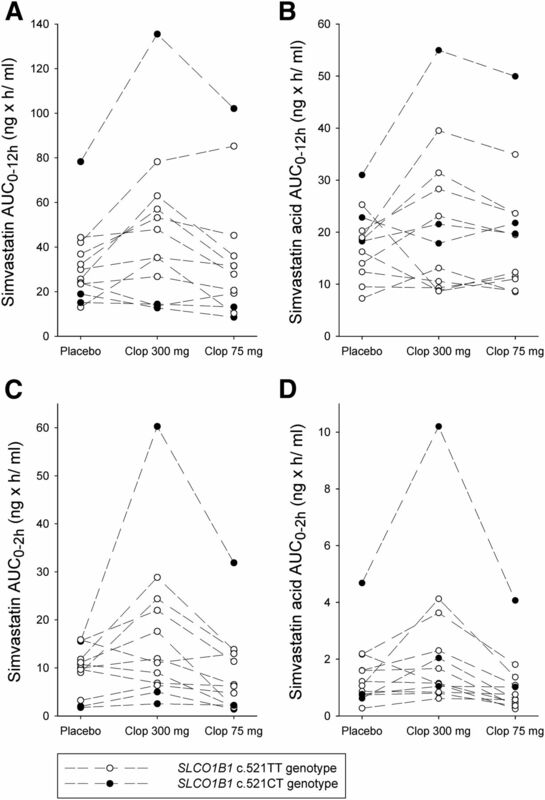 When assessing the AUC0–2 hours, AUC0–12 hours, and AUC0–∞ of simvastatin and simvastatin acid on day 3 of the clopidogrel phase, their residual concentrations from day 1 were taken into account by subtracting the residual AUC from the observed AUC on day 3. The residual AUC was calculated by dividing the residual concentration on day 3 by the ke estimated on day 1. Residual concentrations were observed in 8 and 10 of the individuals for simvastatin and simvastatin acid, respectively. Their geometric mean residual AUC0–∞ were 2 and 4% of the total AUC0–∞ on day 3, respectively. Buffy coats were prepared from 9 ml of whole blood EDTA samples after plasma separation. Genomic DNA was extracted from the buffy coats using the Maxwell 16 LEV Blood DNA Kit on a Maxwell 16 Research automated nucleic acid extraction system (Promega, Madison, WI). The participants were genotyped for the SLCO1B1 c.521T>C SNV by allelic discrimination with a TaqMan genotyping assay on a QuantStudio 12K Flex real-time polymerase chain reaction system (Life Technologies, Carlsbad, CA) (Pasanen et al., 2006b). Based on the pharmacokinetic results of a previous crossover study with simvastatin (Backman et al., 2000), the number of subjects was estimated to be adequate to detect a 30% change in the AUC of simvastatin and simvastatin acid between the control and clopidogrel phases, with a power of at least 80% (α level of 5%). The results are expressed as geometric means with geometric coefficients of variation or 90% confidence intervals (CIs) unless otherwise indicated. Logarithmic transformation was used for pharmacokinetic variables, except tmax, before statistical analysis. The pharmacokinetic variables were compared by repeated measures of analysis of variance, with the treatment phase as a within-subjects factor and the treatment sequence as a between-subjects factor, with pairwise comparisons with the Fisher’s least significant difference method. The tmax data were compared using the Wilcoxon signed rank test. P values below 0.05 were considered statistically significant. Clopidogrel 300 mg (day 1) increased the concentrations of parent simvastatin, particularly during the absorption phase, but no such effect was observed after the 75-mg clopidogrel dose on day 3 (Fig. 1; Table 1). After 300 mg of clopidogrel, the AUC0–2 hours and AUC0–12 hours of simvastatin were 156% (P = 0.02, 90% CI of the geometric mean ratio 1.16–2.09) and 132% (P = 0.08, 90% CI 1.02–1.72) of that during placebo. On day 3, after the second 75-mg clopidogrel dose, the AUC0–2 hours and AUC0–12 hours of simvastatin were 75% (P = 0.23, 90% CI 0.50–1.12) and 96% (P = 0.75, 90% CI 0.79–1.18) of that during placebo. Compared with placebo, neither 300 mg (day 1) nor 75 mg (day 3) of clopidogrel caused statistically significant changes in the Cmax, t1/2, or tmax of simvastatin. The effect of clopidogrel (300 mg on day 1, followed by 75 mg on days 2 and 3) on the pharmacokinetics of simvastatin (40 mg) administered 1 hour after placebo or after clopidogrel on days 1 and 3 of clopidogrel treatment in 12 healthy volunteers. (A) Plasma concentrations of simvastatin (lactone). (B) Plasma concentrations of simvastatin acid. (C) The concentration ratio between plasma simvastatin acid and simvastatin. Note that in (C), the plasma concentrations of simvastatin and simvastatin acid were converted to molar units prior to the calculation of their ratios. Data are presented as geometric means with 90% confidence intervals. For clarity, some error bars have been omitted. Data are given as the geometric mean, with the geometric coefficient of variation, tmax, as the median with the range. The geometric mean ratios between the two phases are given with 90% CI. Clopidogrel 300 mg (day 1) caused a significant rise in the concentrations of active simvastatin acid only in the absorption phase (Fig. 1; Table 1). On day 1 of clopidogrel (300 mg), the AUC0–2 hours and AUC0–12 hours of simvastatin acid were 148% (P = 0.04, 90% CI 1.09-2.01) and 112% (P = 0.52, 90% CI 0.83-1.50) of that during the placebo phase. On day 3, after the second 75-mg clopidogrel dose, the AUC0–2 hours and AUC0–12 hours of simvastatin acid were 66% (P = 0.12, 90% CI 0.42-1.03) and 106% (P = 0.60, 90% CI 0.87-1.30) of that during the placebo phase. The Cmax, t1/2, and tmax values of simvastatin acid during clopidogrel did not differ significantly from the respective values during placebo. Nine of the subjects had the normal-function SLCO1B1 c.521TT genotype, and three were heterozygous for the reduced function c.521T>C SNV. The effect of clopidogrel on the pharmacokinetics of simvastatin and simvastatin acid seemed to be independent of the SLCO1B1 genotype (Fig. 2). Individual area under the plasma concentration time curve (AUC0–12 hours and AUC0–2 hours) values of simvastatin (A and C) and simvastatin acid (B and D) in 12 healthy subjects after ingestion of 40 mg of simvastatin in a crossover study during the three study phases. Simvastatin was ingested 1 hour after placebo and 1 hour after clopidogrel (Clop) 300 mg on day 1 and 1 hour after the last 75-mg dose of clopidogrel on day 3. The AUC0–∞ of the parent clopidogrel, clopidogrel’s active metabolite, clopidogrel carboxylic acid, and clopidogrel acyl-β-d-glucuronide varied up to 10-fold between individuals (Table 2). It should be noted that in some cases, the Cmax may have been missed because the first sample after clopidogrel intake was taken at 55 minutes. The observed tmax of clopidogrel and its metabolites ranged from 55 minutes to 2 hours, i.e., from 5 minutes before to 60 minutes after the administration of simvastatin. Pharmacokinetic variables of clopidogrel, the clopidogrel active cis-5-thiol metabolite, clopidogrel carboxylic acid, and clopidogrel acyl-β-d-glucuronide in 12 healthy volunteers after 300-mg (day 1) and 75-mg dose (day 3) of clopidogrel, which was ingested 1 hour before simvastatin. Data are given as the median with the range. The lipophilic 3-hydroxy-3-methylglutaryl-coenzyme A reductase inhibitor simvastatin and the platelet inhibitor clopidogrel are a common drug combination in the secondary prevention of cardiovascular events. Simvastatin is a well tolerated drug, but its concentration-dependent muscle toxicity is a potentially serious adverse effect that has to be taken into consideration (Armitage 2007). The effect of simvastatin on the activation of clopidogrel has been studied widely due to concerns about the possibly reduced antiplatelet activity of clopidogrel in statin users (Vinholt et al., 2005; Bhindi et al., 2008; Siepmann et al., 2014). However, to our knowledge, the effect of clopidogrel on the pharmacokinetics of simvastatin has not been characterized previously. Our study shows that the use of therapeutic doses of clopidogrel does not affect the total exposure to simvastatin to a clinically relevant extent, although a statistically significant increase was observed in the AUC0–2 hours of both parent simvastatin and active simvastatin acid. These findings suggest that the clopidogrel loading dose could slightly interfere with the disposition of simvastatin during the absorption phase. On days 1 and 3, clopidogrel was administered under supervision, and the plasma concentrations of clopidogrel and its metabolites were similar to those reported in our previous clopidogrel-repaglinide interaction study, with similar clopidogrel dosing (Tornio et al., 2014). Thus, the lack of change in the AUC0–12 hours of simvastatin or simvastatin acid cannot be explained by noncompliance or insufficient absorption of clopidogrel. For safety reasons, our clopidogrel dosing protocol (300 mg followed by 75 mg daily) included the lower clopidogrel loading dose. However, it seems likely that even the maximum 600-mg loading dose would only have a minor, transient effect on the exposure to simvastatin. Furthermore, most of the serious adverse effects of simvastatin take at least several days to develop, which makes the clinical relevance of the effect at maintenance doses of clopidogrel more important. Simvastatin acid is one of the most sensitive marker substrates of OATP1B1, but the pharmacokinetic variables of parent simvastatin are not markedly affected by changes in OATP1B1 function (Backman et al., 2000; Pasanen et al., 2006a; Niemi et al., 2011; Wilke et al., 2012; Giacomini et al., 2013; Ramsey et al., 2014). A relatively common SNV, c.521T>C in SLCO1B1 is associated with increased exposure to simvastatin acid and a higher risk of adverse effects of simvastatin (Pasanen et al., 2006a; Link et al., 2008; Niemi et al., 2011). Similarly, inhibitors of OATP1B1, such as cyclosporine and gemfibrozil, are known to increase the plasma concentrations of simvastatin acid (Backman et al., 2000; Ichimaru et al., 2001). However, part of these effects may be explained by inhibition of cytochrome P450 enzymes, namely, CYP3A4 by cyclosporine and CYP2C8 by gemfibrozil. In the current study, only three of the subjects were heterozygous for the SLCO1B1 c.521T>C SNV and none were homozygous, indicating that they had normal or slightly reduced OATP1B1 activity. Thus, the lack of effect of clopidogrel on the total exposure of simvastatin acid indicates that clopidogrel is not a clinically relevant OATP1B1 inhibitor. Parent clopidogrel is a weak time-dependent inhibitor of CYP3A4 in vitro (Tornio et al., 2014). After oral clopidogrel administration, its concentrations in the intestine and portal blood can be high during the absorption phase, raising the possibility that significant inactivation of intestinal and even hepatic CYP3A4 may occur. CYP3A4 is the most important oxidative enzyme in the metabolism of simvastatin; therefore, simvastatin is one of the recommended in in vivo probe substrates to study CYP3A4-mediated drug interactions (Neuvonen et al., 1998; Prueksaritanont et al., 2003; Huang et al., 2007). For example, grapefruit juice, a strong inhibitor of intestinal CYP3A4, drastically increases the plasma concentrations of both simvastatin and simvastatin acid (Lilja et al., 1998, 2004). Therefore, the increased simvastatin concentrations during its absorption, i.e., its AUC0–2 hours after 300 mg of clopidogrel in the current study, could suggest a weak inhibition of intestinal CYP3A4. However, such a weak inhibitory effect is unlikely to have clinical relevance with any CYP3A4 substrate because simvastatin is one of the most sensitive CYP3A4 probes, the AUC of which can increase up to 20-fold by strong CYP3A4 inhibitors (Neuvonen et al., 1998, 2006). Based on in vitro studies, CYP2C8 is involved in the metabolism of simvastatin acid (Prueksaritanont et al., 2003). Clopidogrel increased the plasma concentrations of repaglinide about 5-fold, and it was estimated that clopidogrel 300 mg causes > 80% inhibition of CYP2C8 (Tornio et al., 2014). The main perpetrator of the pharmacokinetic clopidogrel-repaglinide interaction was found to be clopidogrel acyl-β-d-glucuronide, which was identified as a strong time-dependent inhibitor of CYP2C8. Accordingly, the present results that clopidogrel had no effect on the AUC0–12 hours of simvastatin acid suggest that CYP2C8 does not play a clinically significant role in the metabolism of simvastatin acid in vivo. Recent studies showed that concurrent use of clopidogrel in standard therapeutic doses increases the AUC of rosuvastatin by 50–100% in patients (Pinheiro et al., 2012; Remsberg et al., 2013). Rosuvastatin is excreted principally unchanged, and only a small proportion of rosuvastatin is eliminated via metabolism by CYP2C9 (Neuvonen et al., 2006). Based on the results of the current study, clopidogrel is not a strong inhibitor of OATP1B1, implying that some other mechanism than inhibition of OATP1B1 is likely to explain the clopidogrel-rosuvastatin interaction. In vitro, rosuvastatin is a known substrate of several OATPs, breast cancer resistance protein (BCRP) and sodium taurocholate cotransporting polypeptide (Ho et al., 2006; Huang et al., 2006; Kitamura et al., 2008). In addition to the SLCO1B1 c.521T>C SNV (Pasanen et al., 2007), the ABCG2 (encoding BCRP) c.421C>A SNV is associated with increased plasma concentrations of rosuvastatin in humans (Keskitalo et al., 2009b). It is of note that ABCG2 c.421C>A SNV is associated with increased plasma concentrations of simvastatin lactone rather than simvastatin acid (Keskitalo et al., 2009a). Thus, it is possible that clopidogrel is an inhibitor of other transporters than OATP1B1, e.g., BCRP, explaining the clopidogrel-rosuvastatin interaction. The present study has several implications. First, no clinically relevant interaction between clopidogrel and simvastatin was observed in this study in healthy volunteers. Although a minor effect of the clopidogrel loading dose on simvastatin lactone (about 30% increase in AUC) cannot be ruled out by this study, the typical 75-mg maintenance dose of clopidogrel had no effect on simvastatin pharmacokinetics; therefore, concomitant use of clopidogrel and simvastatin seems to be safe in this respect. Second, as simvastatin acid is very sensitive to the inhibition of both CYP3A4 and OATP1B1, clopidogrel is not a clinically relevant inhibitor of CYP3A4 or OATP1B1 in vivo. Third, the previously reported clopidogrel-rosuvastatin interaction is most likely explained by some other mechanism than OATP1B1 inhibition, as rosuvastatin is less sensitive to changes in OATP1B1 activity than simvastatin acid (Pasanen et al., 2007; Pinheiro et al., 2012). Lastly, this study suggests that the contribution of CYP2C8 to the metabolism of simvastatin is of very small importance in vivo. In conclusion, clopidogrel has no clinically meaningful pharmacokinetic interaction with simvastatin, suggesting that clopidogrel does not cause OATP1B1- or CYP3A4-mediated drug interactions in humans. However, further studies are warranted to investigate the interaction potential of clopidogrel with other transporters and CYP2C8 substrates. The authors thank Katja Halme, Jouko Laitila, Eija Mäkinen-Pulli, Lisbet Partanen, and Saara Poutanen for their skillful technical assistance. Participated in research design: Itkonen, Tornio, M. Neuvonen, P. J. Neuvonen, Niemi, Backman. Conducted experiments: Itkonen, Tornio, M. Neuvonen, P. J. Neuvonen, Niemi, Backman. Contributed new reagents or analytic tools: Itkonen, Tornio, M. Neuvonen, P. J. Neuvonen, Niemi, Backman. Performed data analysis: Itkonen, Tornio, M. Neuvonen, P. J. Neuvonen, Niemi, Backman. Wrote or contributed to the writing of the manuscript: Itkonen, Tornio, M. Neuvonen, P. J. Neuvonen, Niemi, Backman. The study was supported by grants from the Helsinki University Central Hospital Research Fund and the Sigrid Jusélius Foundation (Helsinki, Finland). (2008) Interaction between statins and clopidogrel: is there anything clinically relevant? QJM 101:915–925. (2010) Ultra-performance LC MS/MS method for quantification of clopidogrel active metabolite. J Sep Sci 33:1968–1972. (2012) A screening study of drug-drug interactions in cerivastatin users: an adverse effect of clopidogrel. Clin Pharmacol Ther 91:896–904. (2013) International Transporter Consortium commentary on clinically important transporter polymorphisms. Clin Pharmacol Ther 94:23–26. (2014) Grapefruit juice inhibits the metabolic activation of clopidogrel. Clin Pharmacol Ther 95:307–313. (2006) ATP-dependent transport of rosuvastatin in membrane vesicles expressing breast cancer resistance protein. Drug Metab Dispos 34:738–742. (2007) Drug interaction studies: study design, data analysis, and implications for dosing and labeling. Clin Pharmacol Ther 81:298–304. (2001) Changes in lipid metabolism and effect of simvastatin in renal transplant recipients induced by cyclosporine or tacrolimus. Atherosclerosis 158:417–423. (2005) Metabolism of repaglinide by CYP2C8 and CYP3A4 in vitro: effect of fibrates and rifampicin. Basic Clin Pharmacol Toxicol 97:249–256. (1999) Effect of itraconazole on cerivastatin pharmacokinetics. Eur J Clin Pharmacol 54:851–855. (2009a) Different effects of the ABCG2 c.421C>A SNP on the pharmacokinetics of fluvastatin, pravastatin and simvastatin. Pharmacogenomics 10:1617–1624. (2009b) ABCG2 polymorphism markedly affects the pharmacokinetics of atorvastatin and rosuvastatin. Clin Pharmacol Ther 86:197–203. (2000) Rifampin greatly reduces plasma simvastatin and simvastatin acid concentrations. Clin Pharmacol Ther 68:592–597. (1998) Grapefruit juice-simvastatin interaction: effect on serum concentrations of simvastatin, simvastatin acid, and HMG-CoA reductase inhibitors. Clin Pharmacol Ther 64:477–483. (2004) Effects of regular consumption of grapefruit juice on the pharmacokinetics of simvastatin. Br J Clin Pharmacol 58:56–60. (2008) SLCO1B1 variants and statin-induced myopathy--a genomewide study. N Engl J Med 359:789–799. (1993) Clinical pharmacokinetics and practical applications of simvastatin. Clin Pharmacokinet 24:195–202. (1998) Rational assessment of the interaction profile of cerivastatin supports its low propensity for drug interactions. Drugs 56 (Suppl 1):15–23, discussion 33. (2006) Drug interactions with lipid-lowering drugs: mechanisms and clinical relevance. Clin Pharmacol Ther 80:565–581. (2011) Organic anion transporting polypeptide 1B1: a genetically polymorphic transporter of major importance for hepatic drug uptake. Pharmacol Rev 63:157–181. (2006b) Frequencies of single nucleotide polymorphisms and haplotypes of organic anion transporting polypeptide 1B1 SLCO1B1 gene in a Finnish population. Eur J Clin Pharmacol 62:409–415. (2007) Different effects of SLCO1B1 polymorphism on the pharmacokinetics of atorvastatin and rosuvastatin. Clin Pharmacol Ther 82:726–733. (2006a) SLCO1B1 polymorphism markedly affects the pharmacokinetics of simvastatin acid. Pharmacogenet Genomics 16:873–879. (2012) Pharmacokinetic interactions between clopidogrel and rosuvastatin: effects on vascular protection in subjects with coronary heart disease. Int J Cardiol 158:125–129. (1997) In vitro metabolism of simvastatin in humans [SBT]identification of metabolizing enzymes and effect of the drug on hepatic P450s. Drug Metab Dispos 25:1191–1199. (2003) The human hepatic metabolism of simvastatin hydroxy acid is mediated primarily by CYP3A, and not CYP2D6. Br J Clin Pharmacol 56:120–124. (2014) The clinical pharmacogenetics implementation consortium guideline for SLCO1B1 and simvastatin-induced myopathy: 2014 update. Clin Pharmacol Ther 96:423–428. (2013) Identification of a new drug-drug interaction between clopidogrel and rosuvastatin mediated through OATP1B1. Clin Pharmacol Ther 93 (Supplement 1):S8. (2014) Interaction of clopidogrel and statins in secondary prevention after cerebral ischaemia - a randomized, double-blind, double-dummy crossover study. Br J Clin Pharmacol 78:1058–1066. (2013) OATP1B1-related drug-drug and drug-gene interactions as potential risk factors for cerivastatin-induced rhabdomyolysis. Pharmacogenet Genomics 23:355–364. (2014) Glucuronidation converts clopidogrel to a strong time-dependent inhibitor of CYP2C8: a phase II metabolite as a perpetrator of drug-drug interactions. Clin Pharmacol Ther 96:498–507. (1990a) Metabolic disposition studies on simvastatin, a cholesterol-lowering prodrug. Drug Metab Dispos 18:138–145. (1990b) In vitro and in vivo biotransformation of simvastatin, an inhibitor of HMG CoA reductase. Drug Metab Dispos 18:476–483. (2005) The antiplatelet effect of clopidogrel is not attenuated by statin treatment in stable patients with ischemic heart disease. Thromb Haemost 94:438–443. (2012) The clinical pharmacogenomics implementation consortium: CPIC guideline for SLCO1B1 and simvastatin-induced myopathy. Clin Pharmacol Ther 92:112–117. (2000) Quantitation of simvastatin and its beta-hydroxy acid in human plasma by liquid-liquid cartridge extraction and liquid chromatography/tandem mass spectrometry. J Mass Spectrom 35:1133–1143.